I just love it when Joyce drops by for a visit today! Thanks so much to Lori for hosting me a third time and setting up the tour. Last year, I was terrified to do a tour but Lori made it painless. I didn’t hesitate to ask her to set up another one this year. Writing the three books in the Brewing Trouble series has been a blast. I love my characters and they’ve become like family to me. I have a feeling everyone who writes a cozy series feels the same way about their imaginary friends. For those who haven’t read the series, I decided I’d introduce some of my friends to “yinz guys” as we say in Pittsburgh. Maxine “Max” O’Hara is the protagonist in the series. She’s a brewmaster who opens a brewpub in the Lawrenceville neighborhood of the City of Pittsburgh. She’s kind-hearted and usually sees the best in people. She’s the youngest (and the only girl) in a large Irish family. Her dad is a homicide detective, and her oldest brother is a Catholic priest. The family—at least the ones who live in Pittsburgh—gather for dinner every Sunday at her parents’ house and there’s almost always a pick-up football game in the backyard. Candy Sczypinski owns Cupcakes N’at, the bakery next door to the Allegheny Brew House. Candy looks like Mrs. Santa Claus except she wears the black and gold colors of her beloved Pittsburgh Steelers. Candy has an interesting past. She seems to know everything about everyone and Max constantly speculates how she manages to know so much. 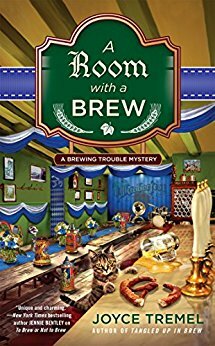 Her questions are answered in the third book, A Room With a Brew, when Candy’s background is revealed. Kristie Brinkley is the owner and barista at Jump, Jive & Java, the coffee shop across the street. Kristie doesn’t look anything like the former supermodel with almost the same name. She resembles Halle Berry, if Ms. Berry had multi-colored hair. Daisy Hart owns Beautiful Blooms, the flower shop. She wears her blonde hair in braids which makes her look much younger than she is. Elmer Fairbanks. What can I say about Elmer? He’s my favorite character. He’s in his nineties and fought with the 101st Airborne in World War II. Elmer tells it like it is. He’s cranky, but belovedly so. I think he has a soft spot for Max, and vice versa. He and Candy often verbally spar, but it’s all good-natured. Most of the time anyway. I always have fun writing scenes with Elmer in them. It’s even better when I get to write Elmer and Candy insulting each other! Elmer looks out for Max. In the first book, To Brew or Not to Brew, he even offers to be her bodyguard. Max is pretty sure she doesn’t need a ninety-year-old bodyguard. If you read the books, I hope you come to love them as much as I do. And I would love to hear what you think! Thank you Joyce, I love these characters! I get so excited every time Joyce Tremel releases a new book! Readers arrive in town just as the Allegheny Brew House is getting ready for Oktoberfest complete with an “oompah” band. But when one of the group is murdered and her friend Candy is hiding something. Max can’t help herself from doing some investigating on her own. Max and Jake are such a great couple. She knows beer and he knows food. They are both strong and independent and devoted to each other. Especially when Jake’s ex comes to town, we see he only has eyes for Max no matter how hard Victoria tries to drag him away. The mystery this time was very complex. There are several twists to untangle as connections are discovered among many of the suspects. Some come from the past, things Max had no idea about, and those involved hesitate to let her in on the whole story. Living in Wisconsin we have our share of German descendants, including me. I absolutely loved that every recipe included in the back of the book and mentioned in the story are for foods that graced out table growing up and many still do today. The pretzel salad is one of my faves! Max may be from a big Irish family but the girl knows how to celebrate Oktoberfest even if she has to catch a killer first. Each story can be read on its own but I recommend you read them all for maximum enjoyment. Loved reading about this book and series. Am going to try to get my hands on the first books in the series first before I read this one. Would love to win it! Great rundown of your fun characters! Looking forward to this! This series sounds so captivating that I’ve gone ahead and ordered the first two books in the series and hope to win this one. Thanks for this delightful cozy. 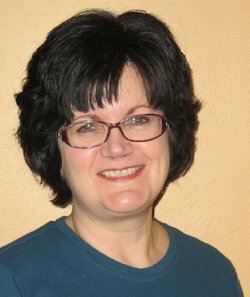 Thank you so much for hosting Joyce Tremel and her latest book on your blog. When I saw the cover, suddenly I wanted a beer on tap. Also thanks for the giveaway. My fingers are crossed. Thanks for the review–I’ll definitely check it out! When I pick up a book and see that the author is Joyce, I know I’m going to enjoy it. Thank you! The growth of micro-breweries is amazing. Just in time for the season! Want to hear the oompah band :-). Sounds like a great read.. Thanks for the chance to win! Loved the first one, and just realized I missed the second. I grew up in Pittsburgh so this was extra fun to read. I would love to win & start reading this series. Thanks for all the kind words, everyone! I really hope you love this book as much as loved writing it. Sounds terrific! Always like reading books with a setting that is family history. I am so excited for this release!!! I own the first one but that’s it. I need to get caught up before they get away from me. Sound like interesting characters and a fun story. I look forward to reading it. I have the first two in the series so I’d love to win this one! Thank you for the giveaway! I loved the first two books in the series and can’t wait to read the third! Oh, dear, I see the cover has beer-garden-style tables! I prefer booths! Sounds like fun! Really enjoyed the description of the book. This is a new series to me. Sounds like a great read. THIS IS A NEW SERIES TO ME. THANKS FOR THE GIVEAWAY!